We were recently in San Diego for Oakley’s Progression Session and Shape Magazine’s Diva Dash. We held a special Bombshell Bootcamp workout during the event for 200 of Oakley’s VIP’s as part of theirlive ambassador search! We had a blast and are looking forward to meeting more amazing women at the Boulder and Dallas/Fort Worth events in May! For details on how you can join the event and apply to be an Oakley Ambassador read here. 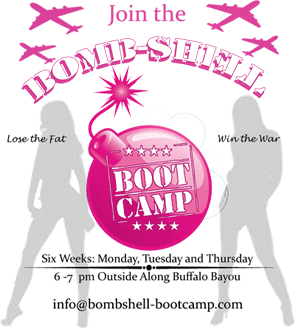 *Be sure to “like” our Bombshell Bootcamp Facebook Page! We post sample workouts and tips there every week! We recommend you do this workout after a cardio session. But, it can be done on it’s own if you are short on time. This routine is a total body routine with core intervals mixed in. 15-20 Pushup Jacks (when you lower down into pushup position – jump feet out wider than hips. Jump feet back in together as you push yourself back to the top). 15 Sets Reverse Lunges with a core twist (alternate legs so 30 total). For the core twist, as you lower down into lunge position, twist your core and upper body slightly to the right when your right leg is in front and vice versa for left. To make it harder hold a dumbell at your chest. CORE: Do mountain climbers (flat back) for 60 seconds. 15-20 Tricep Pushups. Do them on your knees unless your form is perfect. Hands under shoulders (not wide) and keep elbows by your sides as you lower down. CORE: 50 Double Crunches: Hands behind head, knees bent. Crunch knees to elbows and lift both upper and lower body at the same time (hips come off ground) as you crunch into a ball. Release and repeat. *Repeat both Circuits 2-3 times! Let us know how you like the workout on our FB page : ) Hope to see you in CO or TX next month!